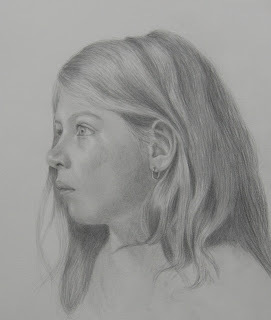 This is my second attempt drawing this portrait as a study for a future oil painting. The first portrait's proportions were quite off so for this one I really tried to slow down and take the time needed to get things correct at the beginning. I think it turned out much better this time :) I also modeled the form more slowly to get a better idea of the structure of her face. Unfortunately I am working from a photo for this portrait and a lot of the structure is lost in the photo so I tried to really focus on building up her facial features using the knowledge I have been getting from my life drawing classes and anatomy studies. I need to study anatomy a lot more so expect some strange skull and muscular sketches in the future! I hope I have learned enough to start the oil painting in the near future.